Carcinogenic corporate waste products that are dumped directly into the river or otherwise seep into the ground water are known to sicken and then kill living creatures downstream. As I was growing up, I fished in the Minnesota River and I witnessed the beginnings of the mortal wounding of that river because of massive corporate farm chemical runoff. The Minnesota went from swimmable and fishable to muddy, smelly, toxic and relatively fishless during the years in which I was coming of age. So far the corporate criminals in the Big Oil, Big Chemical and Big Agribusiness cartels have been making “good for us” but “bad for your planet” economic decisions, but they keep getting off with barely a rap on the knuckles for contributing to the slow death of our increasingly poisoned planet, especially the water. And, just like the Big Bank’s predatory lenders on Wall Street who have had controlling power in all recent administrations, the corporate elites are still awarding themselves lavish bonuses and getting everything they want from our bribed legislators and co-opted Supreme Court justices. Whatever the highly paid lobbyists from Big Business tell us in their ever-present, staged Big Media interviews, the only things that really matter to them and their paymasters is shareholder value, the next quarter’s profit report and today’s share price (that they know will not be adversely affected by the ever-present criminal or unethical activities – Big Media will not be reporting on them!). Of course, the history of petroleum pollution of the once pristine, fertile and life-giving waters of the Gulf of Mexico didn’t just start with Big Oil’s inadvisable – and very risky – deep water drilling. In 1946, flush with pride at winning WWII, the US Department of the Navy established a base of naval air operations on the shores of the Gulf of Mexico. For the purpose of recruiting pilots to the Navy and raising unit morale it started performing airshows for the public, and the Blue Angels flying team was born. The Gulf has been its base of operations ever since, first at Jacksonville, Florida (until 1950), then at Corpus Christi, Texas (from 1950 to 1954), and finally at its permanent home at Pensacola. The Angels began petro-poisoning the Gulf when the Navy found it advisable to have its fighter jets dump excess fuel over the Gulf just prior to landing, thus decreasing the remote possibility of a lethal fireball engulfing the plane and pilot in case of a crash landing. No records seem to have been kept to quantify the volume or frequency of such fuel dumps, and, simply out of ignorance or arrogance, no environmental impact study was ever considered. I have heard that the Blue Angels have discontinued fuel dumping a number of years ago when the price of fuel rose dramatically; so now they only dump fuel before landing in certain emergencies. JP-5 is actually a highly refined kerosene that also contains a complex mixture of volatile chemicals that can be toxic to liver, brain, kidney and immune systems. The military personnel who handle the JP-5 fuel are at high risk of being poisoned by inhaling either the raw fumes or the engine exhaust. Those exposed can easily develop, in a delayed fashion, chronic illnesses because of the toxicity of the VOCs. In 2014, the Blue Angels were in my hometown of Duluth, MN, headlining the biannual stunt-flying air show, which many of those critical of US militarism, US imperialism and US exceptionalism derogatorily call the Dulut Hairshow. During the pre-show promotional build-up, a local journalist for the Duluth News-Tribune was given a publicity ride and wrote in his column that the jet he rode in burned 1,200 gallons (8,000 pounds) of fuel per hour. That number should sober us all, for 1,200 gallons of fuel for a fuel-efficient car that gets 40 mpg would cover 48,000 miles. If you were driving 10,000 miles per year, the amount of fuel that that jet burns up in one hour would fuel your car for nearly 5 years. Back then 1,200 gallons of JP-5 cost the military upwards of $12,000 (at $10/gallon). If one multiplied that consumption by 6 (the number of jets in each Blue Angels performing team) the fuel costs for 60 minutes would be $72,000 just for the fuel costs (not counting the daily practice sessions that also last an hour). And those costs didn’t factor in the fuel consumption for the round trip to Florida and back for each of the 70 air shows that the Blue Angels do in a typical year. Do the math and you will start to rethink the wisdom of supporting such environmentally-insensitive and unsustainable entertainment events. The next day, 6 Thunderbirds left Duluth for their only reason to be in Minnesota: to do a 10 second flyover for the start of the Major League Baseball All-Star game at Target Field in Minneapolis. The flyover was to coincide with the last strains of the Star Spangled Banner. Two spare jets, who made the trip for nothing, were left sitting on the tarmac in Duluth. The News Tribune reporter covering that story wrote that “each of the multi-million dollar fighter jets will consume about 3,000 pounds – or 500 gallons – of fuel to make the (30 minute) round trip to and from Minneapolis. We’re talking big bucks every time either the Blue Angels of Thunderbirds perform or practice, even if one acknowledges that a portion of the costs are covered by civilian event sponsors. But there is more to understand about US military air shows that should raise additional questions. A Duluth News-Tribune reporter covering one of Duluth’s air shows wrote that the commanding officer of one of the flight teams was required to fly a minimum of 3,000 training hours (paid for by the US taxpayer) in order to qualify for the role of commander. The other team members had to fly 1,350 training hours. The journalist noted in that article that there were a total of 15 pilots in the team, although only 6 perform at a time. The team members (the subs as well as prime time flyers) practice their highly technical and dangerous stunts virtually every day of the year in order to keep their skills honed and the air shows safe. As of 2006, there had reportedly been 230 fighter pilots since the Blue Angels started their stunt-flying for audiences. Since the Angels began flying in 1946, about 25 of their pilots have died in crashes, which means that as many as 25 multimillion-dollar planes probably went down in the crashes (this figure does not factor in the number of planes that were demolished while the pilot survived by ejecting safely). In 2011, 70 Blue Angel air shows (two shows per weekend) were presented at 35 different sites, with rehearsal flights the day before each performance. When they are not touring, the Angels practice their routines year-round, usually over the Gulf of Mexico at their Pensacola base of operations. Now for more really sobering math. Using the figures that the journalist obtained from the Blue Angels, the 3,000 hours of training for the single Commanding Officer used up as many as 2,400,000 gallons of jet fuel just to qualify (3,000 hours X 800 gallons/hour)! Of course, this training number does not include the equally enormous amounts of fuel consumed during the air show performances, the rehearsals or the flights to and from Pensacola. 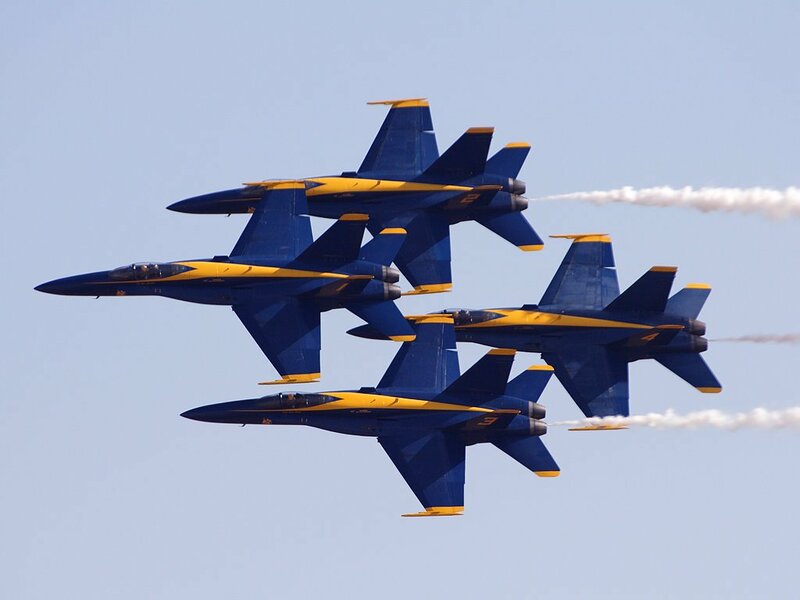 I challenge readers to try to estimate in dollar figures the enormous fuel costs for all of the Blue Angel shows/year, and then try to calculate the fuel used up in the flights to and from Pensacola (or Las Vegas in the case of the Thunderbirds). And then add in the costs of the huge transport planes that carry all the repair parts and the 50 – 55 support crew members in supply and maintenance. Of course, the costs to the American taxpayer are impossible to calculate precisely, but surely it must be billions of dollars per year, admittedly partly offset by ticket sales. Nevertheless, the burning of precious fuel must be taken into account if and when the future of fuel-wasting military air shows is to be re-considered. This weekend (July 9 – 10, 2016), the USAF Thunderbirds will be headlining the Duluth Air Show. There will be a number of other participants, all using up increasingly scarce petroleum products for purposes of entertainment and the recruitment of starry-eyed, vulnerable young children who have been primed for wanting to join the military professions because of their extensive experience with first person shooter videogames that make homicidal violence normal and attractive. America is headed for an over-population, Peak Oil, economic and climate change cliff, so isn’t it about time for people to get serious about the worrisome realities above? We live in a world of rapidly dwindling fossil fuel resources that are cavalierly being squandered by thousands of sociopathic corporate misleaders on Wall Street and War Street, including Big Oil, Big Agribusiness, Big Chemical, Big Food, Big Media and Big Armaments. Each of these industries – in one way or the other – profits from wars and rumors of war, and so the mesmerizing beat goes on. And then of course we have our equally pro-war political (in both major parties) and military misleaders at both state and federal levels that have been mis-leading America into our current quagmire of military misadventures everywhere in the world And none of them has a clue as to how to honorably (or even dishonorably) extract our nation out of any of those messes. Too many military veterans are now physically, neurologically and/or spiritually dead or dying (way too often at their own hands), and they sacrificed the best years of their lives not for American “democracy”, but for money-hungry corporations and CEOs that cunningly waved the flag and wore the patriotic lapel pins. Now we know that they never really cared about the well-being of their “cannon fodder” warriors who did the dirty work for them. The flag that multinational corporations and their CEOs pledge allegiance to IS NOT the Stars and Stripes, but it is a flag that has their corporate logo on it. Millions of dead and dying American veterans from every war over the last century enlisted out of a sense of patriotic duty; but most of them soon found themselves 1) disillusioned by the atrocities they had been ordered to commit; 2) sickened from the exposures to military toxins (including the over-vaccination program for every enlistee); 3) malnourished from the highly processed pseudo-food; 4) neurologically and psychiatrically sickened from the ubiquitous cocktails of psych drugs given to them by military psychiatrists, medics and the VA; and 5) tormented by the post-combat demons, the nightmares and the suicidality – all the while earning less than minimum wage. And part of the propaganda that led to think that killing and dying for their nation was glorious may have begun with the supposed glory of military air shows. Hopefully, acknowledging these unwelcome realities will someday set us free from the war-mongering schemers on Wall Street and War Street. One of the purposes of this column is to point out some of the serious downsides of military air shows in order warn others about the connection between America’s unaffordable imperialistic, endless war agenda and the on-rushing energy and environmental crises that have been censored out of our consciousness by a feel-good media that chooses vagueness or silence when courageous clarity is what is needed. 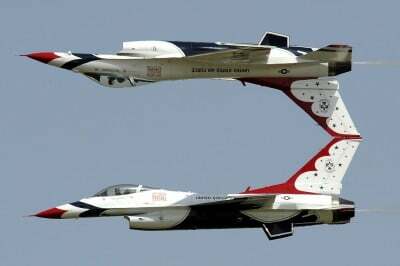 So, this next weekend, many patriotic Duluthians will be watching in wide-eyed wonder the highly skilled jet pilots as they do their breath-taking stunts. But there are many Duluthians who will refuse to spend their time and money attending and supporting these shows. They are capable of understanding the many negatives of America’s energy-wasting air shows that are being sponsored by corporate entities that have closed their eyes to the above realities. Sadly, the Thunderbirds and their sponsors and fans are unconsciously hastening – if nothing is done to change things – America’s inevitable moral and financial bankruptcy by ignoring the wastefulness of burning up precious non-renewable fossil fuel resources and at the same time permanently poisoning the planet and risking the health of everybody and their progeny.